Handsome collection of eight antiquarian novels in red cloth bindings. They feature gilt decoration and lettering. 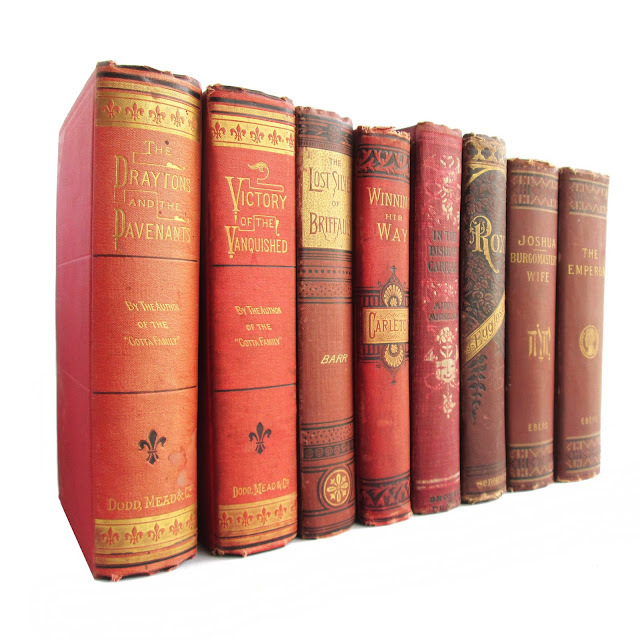 Total size of the books are 11" x 7.5" x 5." Novels by Amelia Barr, Georg Ebers, Charles Coffin and more . Detailed descriptions below. IN THE BISHOPS CARRIAGE Michelson, Miriam Grosset and Dunlap Fair 1904 Hardcover, red with black lettering and decorations of flowers in a basket. Illustrated with six pictures by Harrison Fisher. 280 pgs. 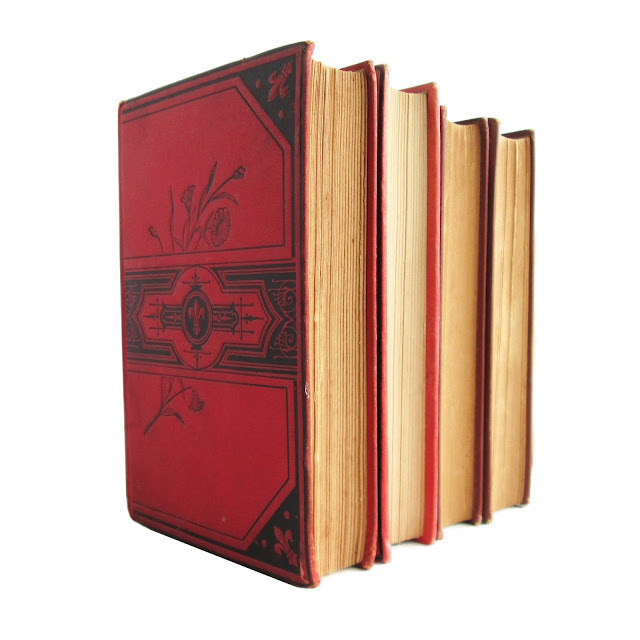 5x7.5 Book is in fair condition with tanned pages, darkened and slanted spine, edgewear, cover stains, rubbing, wear, and soil. THE DRAYTONS AND THE DAVENANTS A STORY OF THE CIVIL WAR Charles, Mrs. Andrew New York: Dodd, Mead and Co. 1860 Good 1860 Hard Cover. 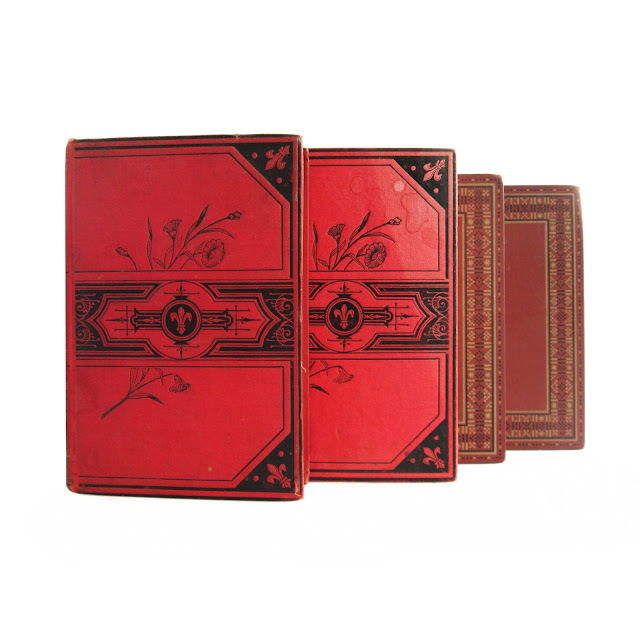 A red book with gold ltg. and black dec. 5"x7.5" with 508 pgs. Some water stains on cover, owner's name. 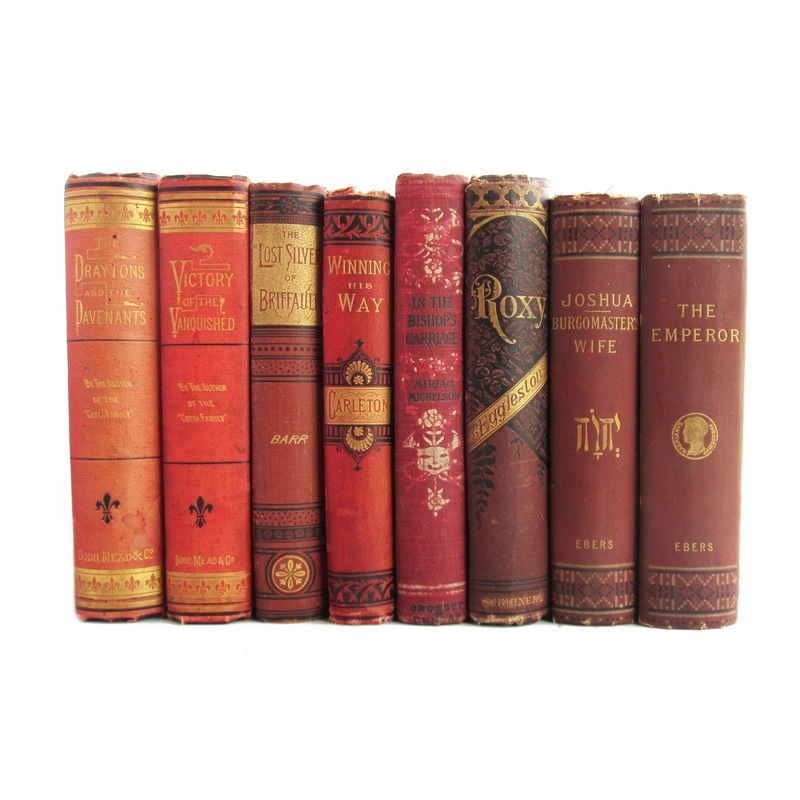 THE EMPEROR Ebers, Georg D. Appleton and Company Fair 1892 This hard cover book has a brown decorative cover with gilt lettering on the spine of the cover. Complete 2 vols in 1 edition. 322 pages. Book is in fair condition with front hinge starting and back hinge cracked, owner's name, edgewear, foxing to the foredge, tanned pages, wear, and soil. 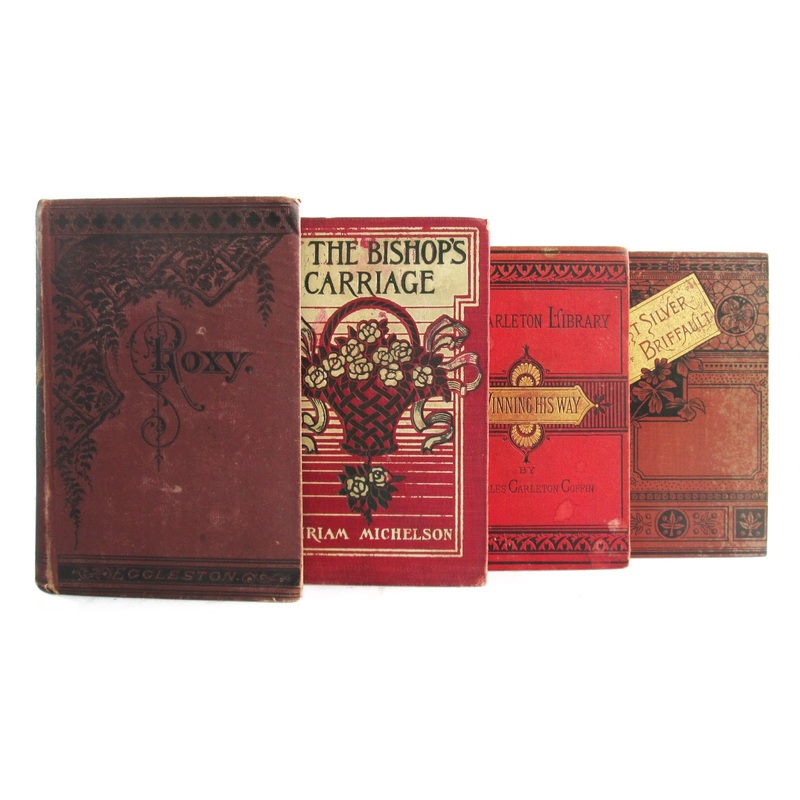 ROXY Eggleston, Edward Charles Scribner's Sons Poor 1878 This 5"x7.5" hard cover book has a red and black decorative illustrated cover with black lettering on the front and on the black floral and gilt decorative spine of the cover. There is no date on the title pages but 1878 is on the copy page. The book is illustrated with 12 black and white engraving illustrations including the frontispiece. A fictional examination of the contrasts between the pioneers and the poor whites on the early Indiana frontier. Cover is well worn and slightly cocked. Interior pages are clean. Front gutter split. 432 pages. 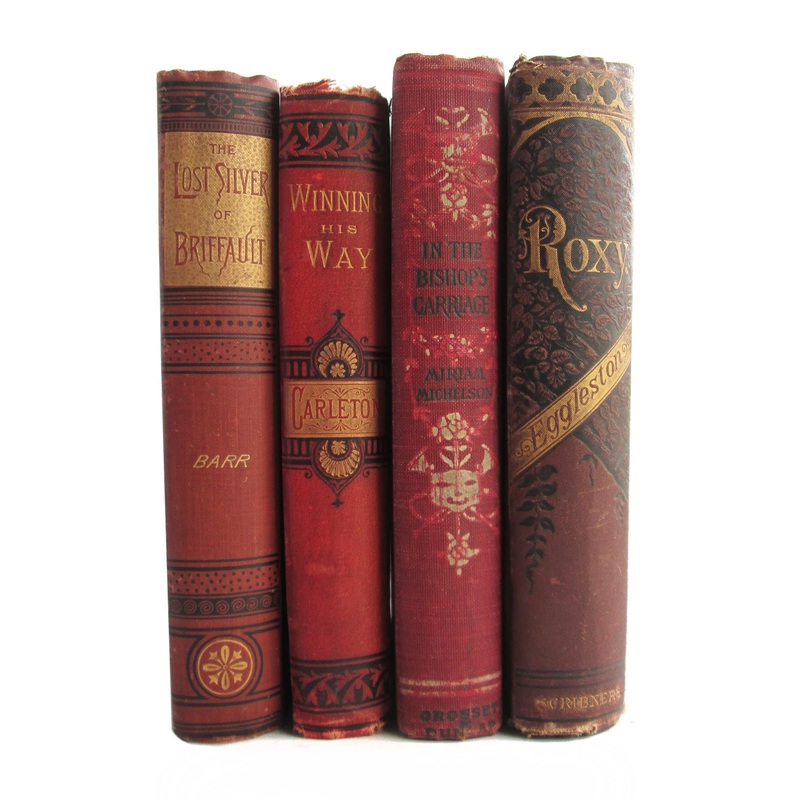 THE LOST SILVER OF BRIFFAULT Barr, Amelia E. Hunt and Eaton Fair 1892 This 5"x7" ANTIQUE, HARD COVER BOOK. has a red and black color illustrated cover with red lettering on the front and spine of the cover. Later printing of first edition. There is silverfishing on the front coversome foxing, cocked spine, wear and soil.. 318 pages. 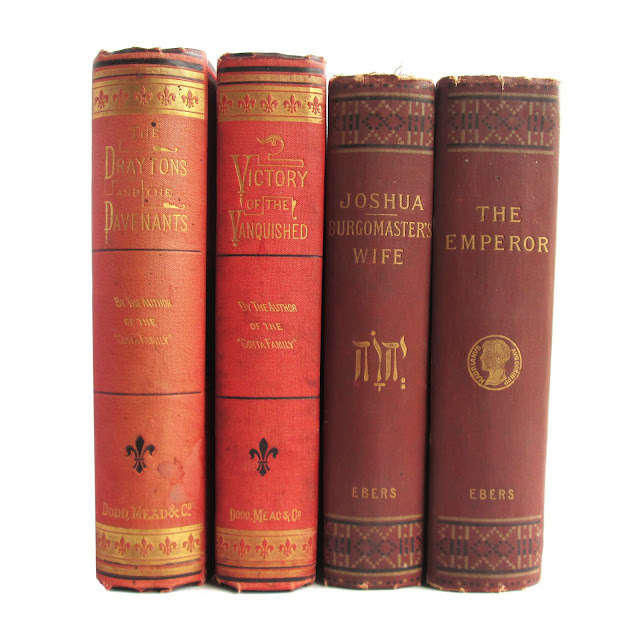 JOSHUA THE BURGOMASTER'S WIFE Ebers, Georg D. Appleton and Co. Good 1892 This antique hardcover book is bound in brown patterned boards with gilt lettering and decoration on the spine. Some cover wear/soil; most inner pages clean. Translated from the German by Mary Safford, this is a Biblical novel. 351 pages; approx. 5"x8". 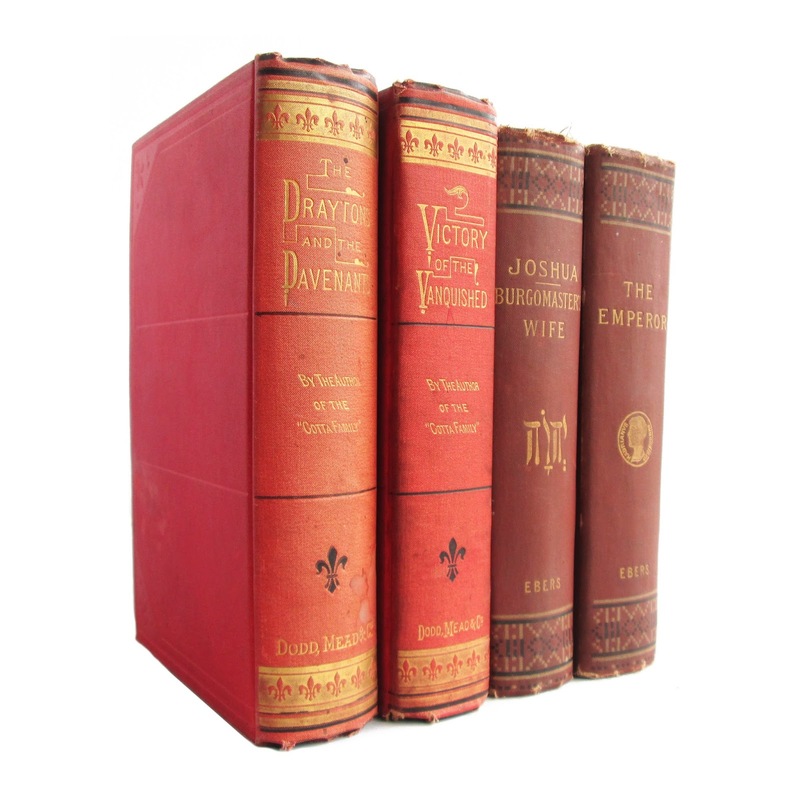 THE VICTORY OF THE VANQUISHED: A STORY OF THE FIRST CENTURY Charles, Elizabeth Rundle Dodd, Mead and Co. Fair 1871 This antique hardcover book is bound in red cloth boards with gilt spine lettering and black cover etching. 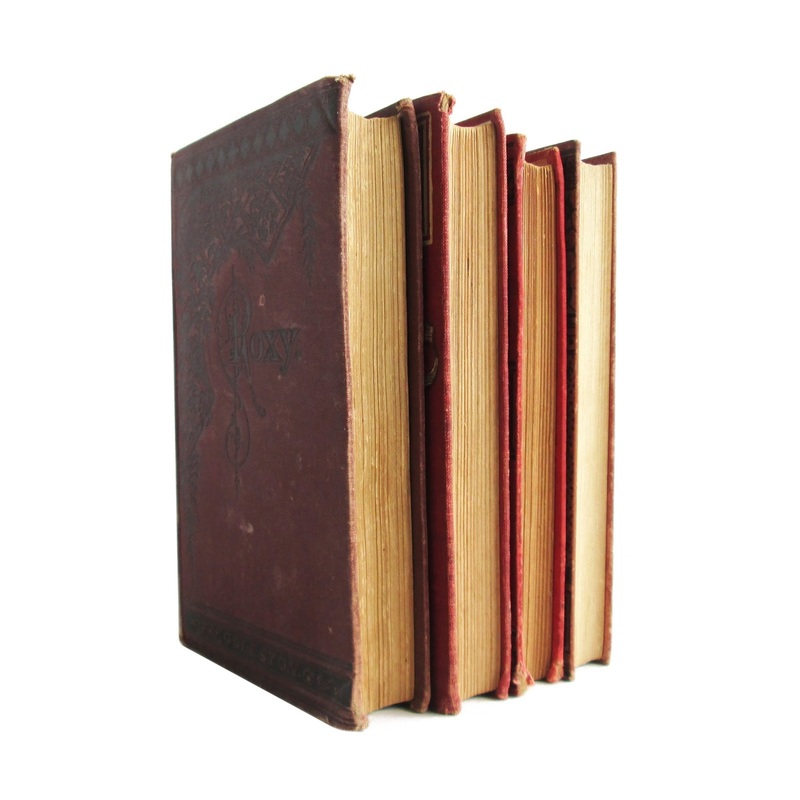 Cover edgewear; spine is worn, soiled, but intact; pages browned, foxing; weak hinges; owner's name in pencil; cover stains . A story set in Biblical times. 520 pages; approx. 5"x8". WINNING HIS WAY Coffin, Charles Carleton Estes and Lauriat Fair 1865 Front endpapers are removed and the hinges are cracked. Cover is stained and has some edgewear. 5"x7" with 258 pages.